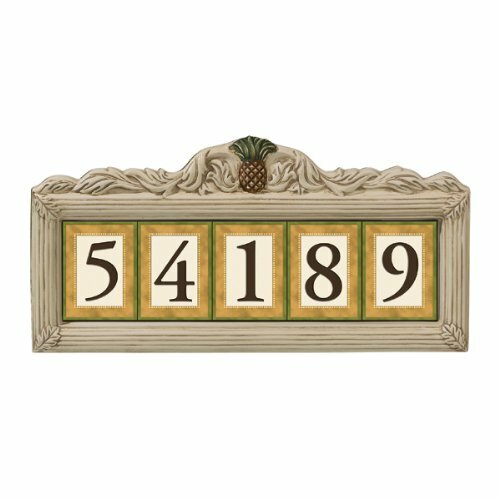 Grasslands Road Estate Pineapple Build Your Address Plaque Five Digit Magnetic Number Tile Holder with Stakes. Stakes are optional to create a yard address plaque (included with plaque). Two holes in back offer option of hanging your plaque. Individual tiles (sold separately) are backed with high power magnets so they fit neatly into metal backed plaque holder. No additional grout or glue needed to secure in place. See coordinating magnetic number and spacer tiles to build your own Grasslands Road Estate Pineapple address plaque. Our alternate four digit tile holder plaque is item no. 445712. Full and half spacer coordinating tiles may be purchased to create address number needed.